Last week a handful of pupils from third, fourth, fifth and sixth class held a mini concert in the PE hall for their classmates. Alicia and I did a great job playing 'Start The Show' and 'Heat Haze' while Cian, Méabh and Matthew did really well playing 'Knicker Blocker Glory'. Everyone really enjoyed the music and they were a great audience. We would have never known these songs without our music teacher Philip, who has been teaching us violin since September. Philip also highlighted some interesting facts about the violin to the audience. Thank you Philip. Recorders teach us 'the building bricks' of Music! 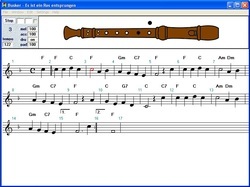 Recorder is played in our school from first class to sixth class. In 1st class, they play three notes B,A,G. As they progress through the years they learn more advanced notes and songs. Recorder is played at the school masses and concerts. The recorder teacher is called Margaret O’Faolain. She comes to teach us every Monday and we have great fun with her. She plays the piano to keep us in rhythm. We play hymns, traditional songs and ballad songs. When all the school play together, we sound very nice and we work well as a team. We are learning how to read music. The notes E,G,B,D,F are on the lines and the notes F,A,C,E are between the lines. Margaret gives us mnemonics such as Every Green Bus Drives Fast and Fantastic Alice Cooks Eggs to help us remember. She teaches us about time signature and how to read the notes. We learn about harmony and melody lines. From learning recorder, we learn all the knowledge and skills to take on another challenge of any instrument particularly from the woodwind and brass families of the orchestra. The Voices of a Choir of Angels! 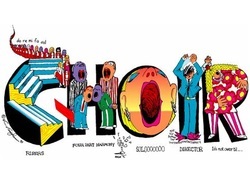 Singing is very popular in our school. We sing at lots of important masses and at our Christmas concert. Ms. Tighe helps us stay on track when we’re singing. We have to practice and prepare well in our classrooms and in our school hall. All the teachers have alot of work to do to help us have our singing pitch perfect on the big day. We also go into the church to have rehearsal so we know what it will be like and will sound just right. We sing many different songs like `You Are Mine’, `Be Still’ & `Happy In The Presence’. Our school also takes part in the Peace Proms. This is a singing choral concert that we enter every second year. Schools all over Ireland take part. We love taking part as we sing with other children in schools around the county and are accompanied by the Cross Border Orchestra of Ireland. The members of this orchestra are young people from North and South of the border dividing the Republic of Ireland with Northern Ireland. We sing songs during class aswell. We learn Irish songs, songs from other countries and we even learn pop songs! Many of the pupils in our school enjoy singing and love preparing for our special occasions. Irish dancing is one of the many activities that all the pupils in Gowran N.S get involved in. Our Irish dancing teacher is called Ann Egan and she helps us learn all of the many steps we do during the years. Ann is a fantastic woman and is an inspiration for alot of children that enjoy dancing with her. She can remember every child's name in the school (which is alot to take in with over 250 pupils in the school). Ann also enters the classes fourth to sixth in a feis at the end of the year so the children have a chance to compete and win trophies and medals. Ann is one of the greatest teachers EVER!!!! jellies, and can’t wait to come back the next year!! Violin players add a string to their bow! Some children learn to play the violin in Gowran N.S. Mr Edmondson teaches us some great tunes. The classes that do it are from 3rd class all the way up to 6th class. As you progress, you learn harder tunes and longer tunes. Every year at Christmas, we learn Christmas tunes. Some music pieces are easier to play than others. Some people play pizzicato [which is without the bow]. The bow is made with horse hair and you put rosin on it. You can get lots of different size violins. We learn classical pieces as we improve. By the time we leave Gowran National School, we are ready to join an orchestra! The Key of D: D, G and A. To begin with, they learn two chord nursery rhymes such as ‘Mary had a Little Lamb’, ‘Ba Ba Black Sheep’. In October, they progress on to three chord Johnny Cash songs such as ‘Ring of Fire’, ‘Walk the Line’ and ‘You are my Sunshine’. The guitar group plays frequent concerts for the other classes. Last week, they invited the Infant classes to come and be the audience. To finish this first term, we have learnt 'Jingle Bells', 'Away in a Manager' and 'Rudolf the Rednosed Reindeer!'. In the new year, the guitarists will learn ‘The Fields of Athenry’and ‘Galway Girl’ (Ms. Tighe’s favourite!). By the end of the year, they will be able to play songs by Oasis and Taylor Swift! Former guitarists from the school are now singer songwriters and playing gigs themselves! Bright futures ahead, and from such humble beginnings as learning nursery rhymes!